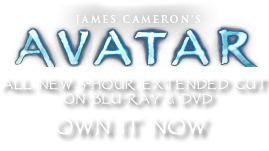 Circular Drums | Pandorapedia: The Official Guide to Pandora | Own AVATAR on Blu-ray & DVD Now! At the beginning of these celebrations, the Na’vi involved (e.g., newly mated couples, new parents, young Na'vi who has completed Iknimaya) will be the first to “ring the drums” (announce the news), swinging the pendulum beater rapidly to hit all the drums, but in no set pattern. Once the celebratory dances have begun, another Na’vi drummer takes over and plays more rhythmic patterns as accompaniment. This drum also announces deaths, except in times of battle. Death announcements consist of three complete cycles of very slow steady strikes, once on each drum. Function Social, accompanies dances, major celebrations and rights of passage. Na'vi Name Neir’eywa’sa jahmka g’hes. Size and Weight Group of drums over six meters high. Materials and Construction Wood, paint, woven materials, animal skins. Drums backed onto a circular open framework suspended from trees. Notes Varying sizes of shallow drums in framework represent Pandora’s solar system. Player stands in center of ring below, and hits drums with a beater suspended from a vine.